#3......"HUNTER HUNTED" - BODIE 3.7 . you'll never walk alone ! MY EYES ARE NATURALLY DRAWN TO BODIE'S OPEN SHIRT. This is a great shot! And very unusual, thank you! thankyou , i love the openess of Bodie's shirt in this shot which we don't get to se very often so why not take advantage that's my excuse. Glad you like it and thankyou for looking . AND WHY DID I NOT SEE THIS BEFORE? oh i'vealways been aware of this scene and i must asmit i do love seeing him dressed in this way so naturally my eyes start drifting in that direction . Thankyou for liking this and for your comment . 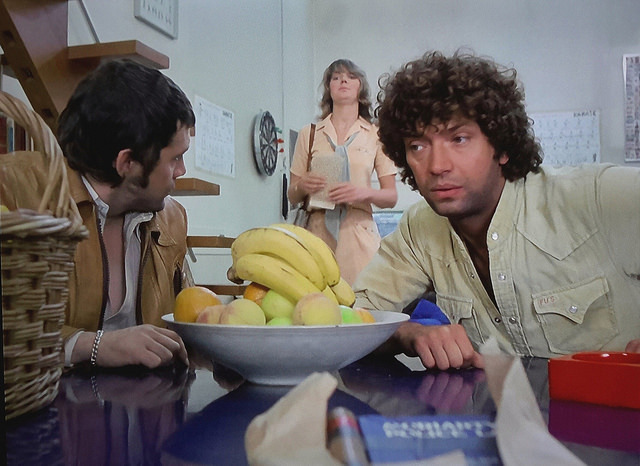 Bodie's got an open shirt, Doyle's thoughts automatically turn to the bananas. Or the lads with a stroppy bird and a bowl of fruit - whatever floats your boat! ha ha , how can Doyle be thinking about a bowl of fruit when he has the image of Bodie with so many buttons undone on his shirt infront of his eyes . Though he could be imagining using some of that fruit on Bodie for later . Hmm - both of the lads have open shirts and a bit of a guilty look on their faces. Mrs Preston doesn't look very happy. I wonder what she had walked in on! A great shot, well captured. Thanks! Yes , it's just that Bodie and so many buttons open on his shirt doesn't appear very often so naturally that is the first direction that my eyes drift to whenever i see this scene, though Doyle seems to be conjuring something up for later especially the way he's looking at the fruit bowl. Thankyou , i'm so pleased that you like it , i know that my eyes are always on alert whenever i see this episode, Bodie and so many buttons undone on his shirt don't come around very often. OMG! I never noticed before! How could I not have noticed before? Thank you sooooooo much for pointing this out!!! i just couldn't resist this shot because the view is so very tempting . It's not often that Bodie wears his shirts so open so viewing is essential . I can't resist another peek myself ...yum . Lovely view! And I'd never noticed Bodie's open shirt! Thank you for alerting me to that! I love Hunter, Hunted because of Bodies open shirts. I think he wears the open shirts in the whole episode. But this shot is a nice one because they look as if they got found out by Miss Preston. Thank you!